Click Here to see my new book! CURRENT INFORMATION ON WORLD RECORD CONTROVERSIES! READ DIRECT EXCERPTS FROM A COMPENDIUM OF MUSKIE ANGLING HISTORY! READ ABOUT LARRY'S NEW PERSONAL BEST MUSKIE! 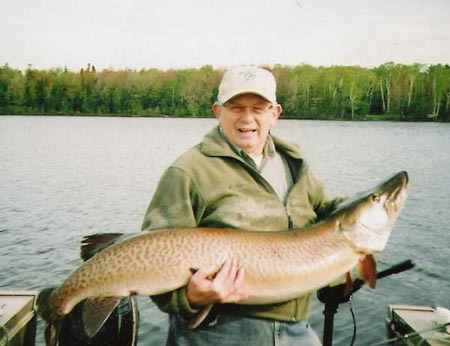 Larry Ramsell is a long time muskie angler with over 60 years of muskie fishing experience. Over those many years, he has caught hundreds of muskies, including 14 over 40 pounds; 7 of those were over 44 pounds, with one a “Bucket List” fish at 51 pounds certified weight. All but one of those were released, the kept one, in 1988, is a line class world record. His current longest is 57.25 inches and weighed a hefty 54 lbs. 6.4 oz. on a certified scale. He also guided his Grandson Caiden to a 57 inch release in 2016. Larry developed the world records program as World Records Secretary for the National Freshwater Fishing Hall of Fame and was a representative of the International Game Fish Association for sixteen years. Among many other positions, Larry is a two term Past International President of Muskies, Inc., and is a permanent member of the board of directors. He is also the former fish historian and world records advisor for the hall of fame. He currently is the chairman of the Modern Day Muskellunge Records Committee. Larry is a well known international free-lance writer on the subject of muskies. His work has appeared in such well known publications as: In-Fisherman; Fishing Facts; Musky Hunter (where he formerly was research editor); Fish & Fang (Germany); North American Fisherman; Ontario Out of Doors (Canada); Ontario Angler & Hunter (Canada); Coarse Angler (England) and Fishing World among others.